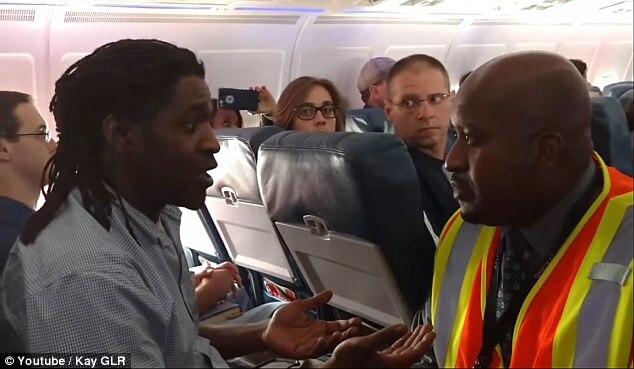 Delta Airlines has come under fire after a video emerged of a passenger being told he had to get off a plane because he used the bathroom during a tarmac delay. Kima Hamilton, a 39-year-old 'DJ and poet' was due to travel on Delta Airlines Flight 2035 from Atlanta to Milwaukee on April 18. Unfortunately for all aboard the flight, they were delayed while waiting on the tarmac for about 30 minutes. During that hold-up, Hamilton needed to go to the bathroom. At one point, he stood up from his seat and walked to the back of the plane, then asked a flight attendant if he could duck in and relieve himself, the Milwaukee Journal-Sentinel reports. The attendant said no, telling the 39-year-old they would 'lose their place in line', if he did, according to the newspaper. Defeated and unrelieved, Hamilton returned to his seat. But as the delay continued and the plane remained stranded on the tarmac, Hamilton's need to go grew stronger. 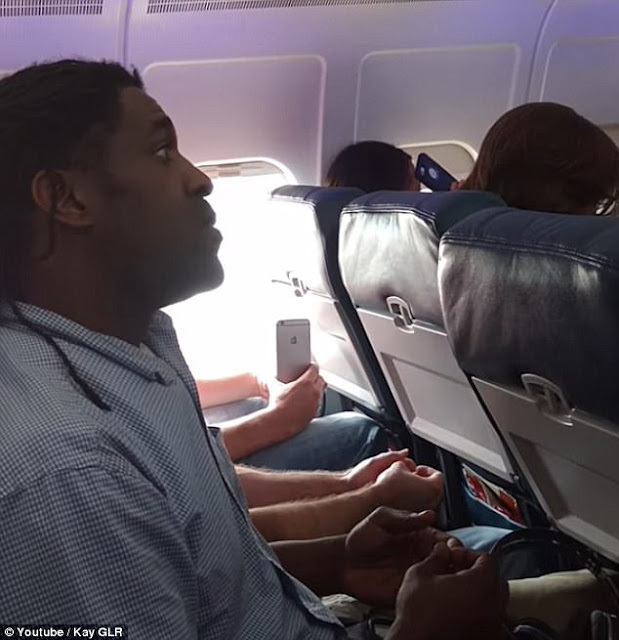 Fearing an 'accident' in his seat, the 39-year-old got back up and walked to the restroom at plane's rear. He went in, flushed, and returned to his seat in about a minute. But as Hamilton was sitting back down and buckling his seat belt, he claimed the flight crew made an announcement over the intercom. 'The pilot came on and said, 'Ladies and gentlemen, I'm sorry for the inconvenience but we have to return to the gate and remove a passenger',' he told the Journal-Sentinel. Footage of what happened next was posted online by Krista Rosolino - another passenger who was sat across the aisle from Hamilton with her husband, Mike, and their infant daughter. The back-and-forth continued for about three minutes, before the official walked down the aisle and exited the plane. 'I have done nothing,' Hamilton is heard saying, before another passenger was heard agreeing there was no need to boot him from the aircraft. But things took a turbulent turn from there. The second video shows another man on the plane, stood in the aisle talking to Hamilton. The 39-year-old continued to explain his desperate need to get to the bathroom, and that he needed to get to Milwaukee to help run a fieldtrip with '94 sixth graders'. The second official, who had kneeled down to listen to Hamilton, was seen laughing in a good natured manner at the comment, before nodding seemingly in an understanding manner. The official then is heard saying: 'Let me just explain, basically any time we are about to take off – for your safety, and for everyone's safety – we need you seated, that's the bottom line. Hamilton finally deplaned alongside all the passengers onboard. They boarded 2hrs later but without Hamilton.